I have just finished reading Staring at the Sun by Irvin Yalom, a remarkable book about facing and overcoming our fear of death. Not the most promising of subjects, you might think, for a light-hearted read but I found it hugely inspiring and life-affirming. Yalom urges us to defy la Rochefoucauld’s maxim: Le soleil ni la mort ne se peuvent regarder en face (You cannot stare straight into the face of the sun, or death). 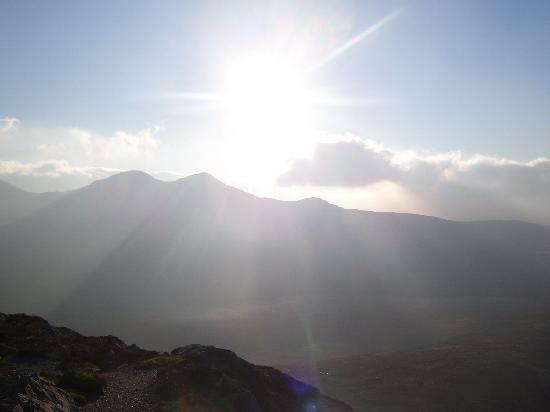 Staring at the sun will blind you but looking death in the eye can help you live a more joyful and fulfilled life, he argues. Drawing on poetry, philosophy, literature, therapeutic case studies and his own long experience (he was 75 when the book was published) Yalom shows us how our existential fear of non-being can rob us of our vitality and willingness to live fully and he quotes a colleague of Freud, Otto Rank: Some refuse the loan of life to avoid the debt of death. Yalom is a secularist. He does not offer the comfort of belief in reincarnation or life after death to soften the blow. Instead he urges us to use the awareness of death to help us become who we are; to savour our lives: The way to value life, the way to feel compassion for others, the way to love anything with the greatest depth is to be aware that these experiences are destined to be lost. As he walked he heard a roar behind him. He looked round and saw a tiger bounding towards him. He ran way as fast as he could, the tiger at his heels. Suddenly he came to the edge of a cliff. With nowhere else to run, he grabbed hold of a vine and swung himself over the edge. Hanging there he looked up to see the tiger drooling above him. Terrified, he looked down, only to see another tiger waiting for him below. Two mice – one white and one black – started gnawing at the vine that was holding him. In that moment, the man saw a wild strawberry growing out of the cliff face nearby. Holding on to the vine with one hand he reached out and plucked it. How sweet the strawberry tasted! As for changing how we live – seizing our ‘one wild and precious life’ – Yalom leaves us with a heartening message: It’s never too late. You’re never too old. Last weekend a small group of men and women gathered at Gaunts House in Wimborne, Dorset to inquire together into the notion of eldership. The youngest member of the group was in her late-forties, the oldest in his mid-sixties; we were not young but neither were we very old. What we had in common was a determination to live richly and fully into old age and to discover for ourselves something about the particular challenges and opportunities that entering our ‘third age’ might offer. In many traditional and indigenous societies there is an important role for elders in maintaining the folk-memory and offering the wisdom of experience to the young. 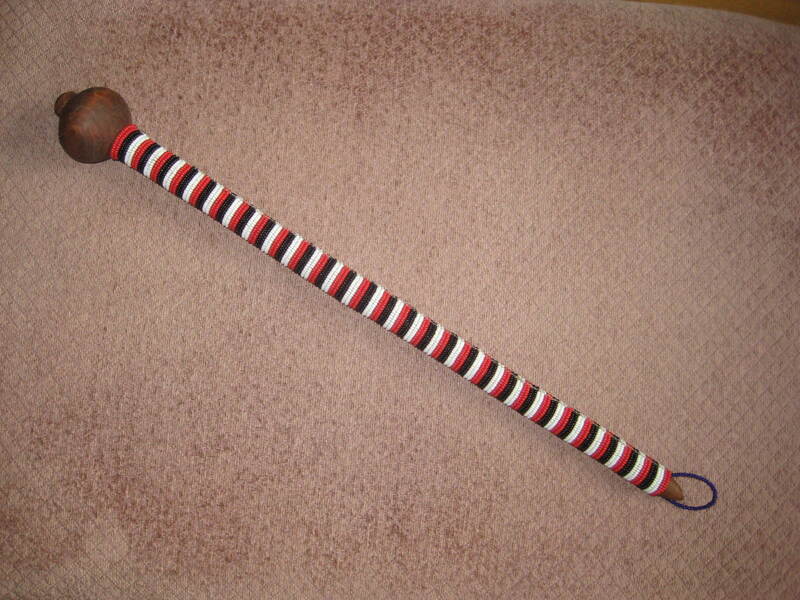 The image above is of a rungu: a Masai ‘talking stick’ that tribal elders pass around to signify who holds the floor during ritual conclaves. One member of the group had been given a rungu by Masai elders many years ago when he worked in Kenya. For those of us gathered at Gaunts House, its presence provoked a lively debate: what does it take in our so-called developed societies to earn the right to carry the badge of eldership? As you might expect, we came to no definitive conclusions (indeed celebrating difference rather than trying to enforce homogeneity was a feature of our emerging understanding of the stance of eldership). Nevertheless, I shall venture some of the personal insights I came away with. • Elders carry an awareness of their place in the great chain of being which impels them not merely to look back nostalgically at what has gone before, but to take greater responsibility for what is to come. Native American elders were said to consider the impact of a possible course of action on the next seven generations before making a decision. • Elders have a responsibility to protect the birthright of our children and of the more-than-human world. If elders do not speak out against the commodification of the commons and the destruction of our planet and its inhabitants, who will? • Eldership is both an individual achievement – a way of being – and a critical role in re-building healthier and more inclusive communities congruent with more humane values and behaviours than are generally apparent in our individualistic and nuclear-family oriented society. • Aspiring elders honour their own elders. In that spirit, I would like to name three inspirational role models: environmental activist Joanna Macy (83), iconoclastic archetypal psychologist James Hillman (who died last year at 85), and Robert Bly (85) founder of the mythopoetic men’s movement. • Elders offer the fruits of their life experiences and contribute their energy, skills, and knowledge to the communities in which they live and work. They earn their place at the fire and are respected for the way they live and not merely for being old. For the first time, there are more people in the United Kingdom over 65 than under 16. By 2025 it is estimated that more than one third of the population will be over 55 and that there will be more people over 60 than under 25. It is obvious that we simply cannot sit back and expect the next generation to take care of us all. Instead, we have the opportunity as we age, to become engaged and inquiring elders who play an active part in the future of our society and our planet. There really is no excuse for becoming passive and complaining ‘grumpy old men’ and ‘grumpy old women’. The invitation to attend the weekend workshop included the words of an old Swedish proverb: The afternoon knows what the morning never suspected. It presupposes that eldership brings a degree of wisdom. Let us hope for all our sakes that the proverb is true. I came across this picture of Holland House Library the other day. It was taken a day or two after it was bombed in a German air raid on 22 October 1940. 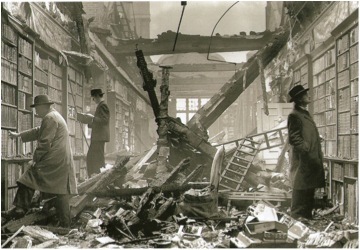 I don’t know the identities of the three splendidly be-hatted men but if I had been around at the time I suspect that I too would not have been able to resist clambering over the wreckage to see what books had survived. When I showed her this image, my friend Sue Hollingsworth from the International School of Storytelling reminded me of a story that she once told me and which we now both tell: The Philosophers Stone, which begins with the destruction of the ancient library at Alexandria in 48 BCE. In the story, a single fragment of papyrus survives the flames. On it is written the arcane secret of the philosopher’s stone that turns base metals to gold. “What do you see when you look at the picture?” she asked me. But I cannot help being fascinated by the books themselves. I like to think that books have lives of their own. They are conceived in the author’s imagination, are mid-wifed by the publisher and brought into the world by the printer. Some become hugely popular. Many sit on shelves unread. A precious few become companions for our whole lives. I still have a well-thumbed copy of E.B. White’s Stuart Little, given to me by my mother when I was 7 years old. The image of Stuart Little, heading north in his car, not knowing if he would ever find his love Margalo but travelling with hope, has encouraged and sustained me for as long as I can remember. It is the one book I would hope to pull from the wreckage. It is in a very real sense my philosopher’s stone. What is yours, I wonder?